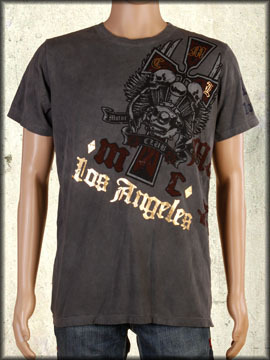 Motor City Legends Flying Cross Machine men's short sleeve t-shirt features tattoo inspired artwork of a large winged engine with a cross, two skulls above with the MCL Los Angeles logo in gold foil. The back has no graphics. 100% cotton, light weight, slim fit. Hand dyed with silicon wash for soft feel. Color: grey mineral wash.